I was running fine on my Ubuntu 14.04 with vpnc and its network manager to connect to my office cisco based VPN. 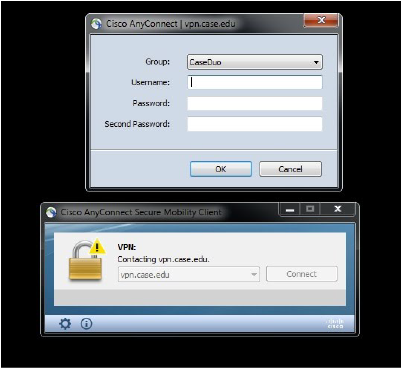 Now they have implemented Mobile Pass to authenticate with an additional Second Password (Generated by Mobile Pass App) along with the existing user password and I am left broken with no option to connect to my office Cisco VPN. I tried Open Client for Cisco AnyConnect VPN and its manager framework on Ubuntu 14.04. But that too doesn’t provide any option for a second password. The windows and Android based Cisco Anyconnect client provides these options by default. I don't yet have the entire stream from my Ubuntu laptop to connect to my work PC by way of Cisco AnyConnect. I do have the VPN working, as when I enable the VPN connection I'm told that I'm connected. What I'm working on is getting a VNC (Remmina) to actually connect with the remote Win7 PC. My work network has the two-password bit enabled. I'm able to enter both passwords. I got to there on Ubuntu through the openconnect / network-manager-openvpn / network-manager-openvpn-gnome stack, along with whatever plugins the install requires. I haven't (yet?) installed the official Cisco software. Once you install the software and hard reboot your PC (things didn't work well with the "Reboot" option) you can create a VPN connection. Once you try to login you're asked for a username, password, another username and another password. I ignore the second username and things are working as I described earlier. I will update this comment once I get the entire end-to-end working. Not the answer you're looking for? Browse other questions tagged vpn cisco or ask your own question. Cisco Anyconnect vs network-manager-openconnect-gnome settings?